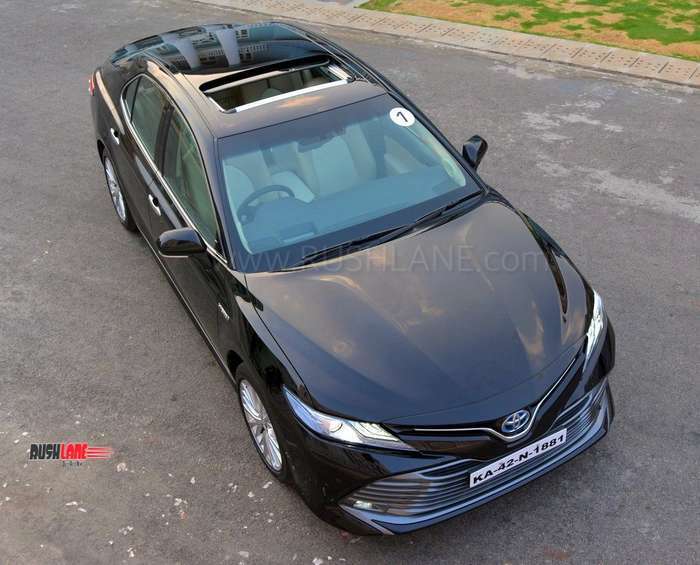 All new 2019 Toyota Camry has been launched in India at a starting price of Rs 36.95 lakhs. The moment one thinks about the Camry, it sounds synonymous with one of the most luxurious cars by a non-hard-core luxury brand. Since its launch in India in 2002, the Camry has carved a niche for itself (sold over 11,000 units), but majorly as a chauffeur-driven car. However, globally the Camry is not just restricted to being a car used by C-suite executives to move around town. Though, it never was a typical driver’s car, but with the 8th generation iteration, Toyota seems to have worked a lot on how the car behaves on the road and how the driver feels while driving it. 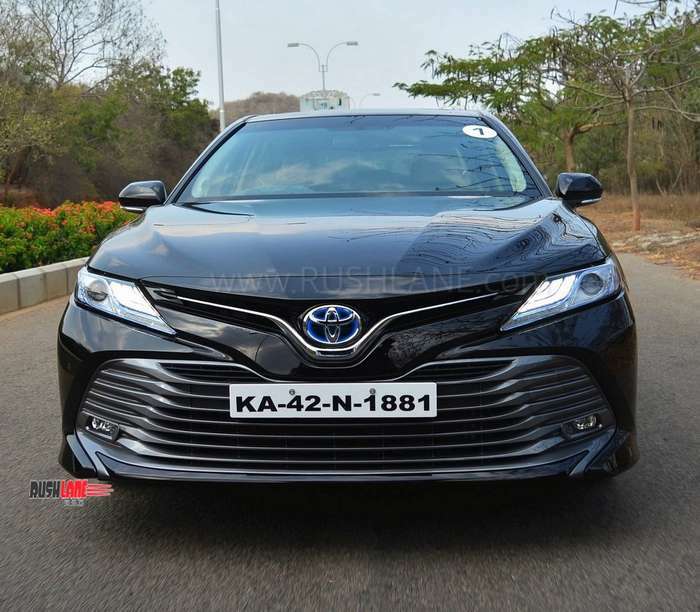 Toyota has just launched the 2019 Camry in India and recently hosted us for a media drive. Here is all that you need to know about the car, irrespective of where you see yourself seated, the driver’s seat or in the rear! Exteriors – From the front, the Camry has become more aggressive looking with a sleeker headlamp section which also houses the LED DRLs. Just like the previous generation Camry, the front bumper design continues to be a little too busy though. There is a sleek chrome grille in the front while a Toyota badge sits nicely tucked in the middle. Move to the side and you realize how long the car actually is! 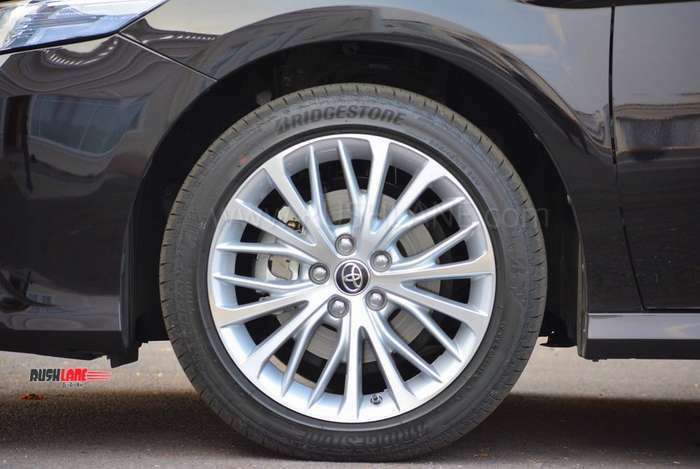 The new 18” alloy wheels look very modern and they will certainly impress you. The elegance continues in the rear as well with a simple yet clean design. A chrome strip on the boot proudly holds an engraved Camry moniker while the LED tail lamps run from the body into the boot. 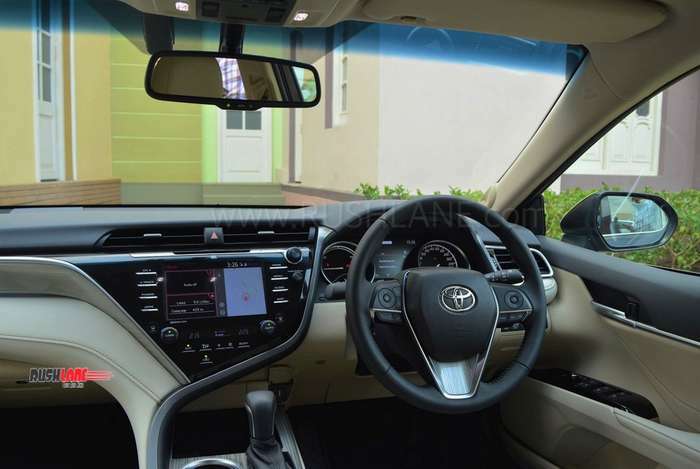 Interiors – The Camry is a long car (4885mm, to be precise) and the description of its interiors has to be long as well, as there is just so much on offer! The moment you step in to the driver’s seat, you are welcomed by a typical Toyota dashboard. However, what is interesting is the neat looking instrument cluster which comes with a TFT screen and a heads-up display (HUD) over it. There is an 8” touchscreen infotainment unit but nothing exceptional about it. However, what we really liked was the 9-speaker sound system from JBL which also employs the Clari-Fi technology, which in simple language means that it will help your favorite sound tracks sound better! Both front seats come with 8-way power adjust systems while there is a memory function for the driver’s seat. The rear cabin is an inviting place to be in, especially due to the arm-rest which also has a capacitive touchscreen unit. That means while you are being moved around in the car, you can adjust your seat (Yes, rear seats are also adjustable! 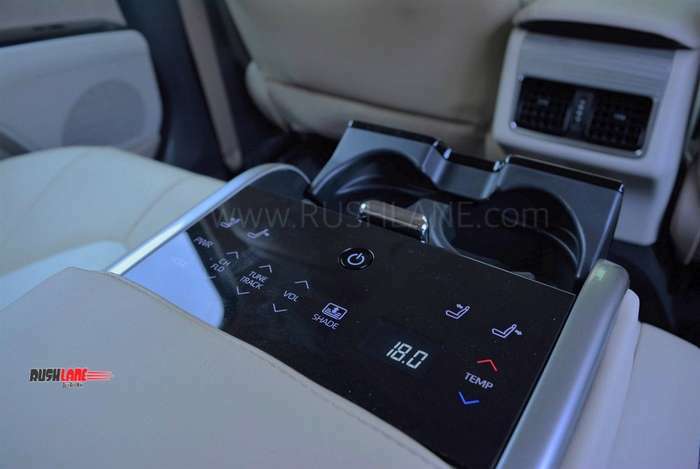 ), select a preferred temperature for your side of the cabin (3-zone air conditioning), adjust the rear blinds, change the track and tune the volume, all from the buttons on the arm-rest! The beige coloured interiors help to make the cabin look big and the sunroof further brings in an airy feel. However, it isn’t the largest cabin in the class, but still manages to provide you ample leg room that you won’t complain about. In case, you need some additional space, you can push the front seats ahead from a button well within your reach (this may or may not be with the front passenger’s consent though). Driving Dynamics – The Camry starts in true EV fashion with the battery powered motor coming into life the moment you touch the accelerator pedal. However, in a second or two, the motor is joined by the engine (a 2.5 litre 4-cylinder petrol unit) and the two start working in tandem, beautifully. We were told that the motor supports the engine for over 50% of the time while the car runs. That means that if you were to drive for a 1,000 km, the battery powered motor would have contributed for a little over 500 kms. As expected in an HV, there is battery regeneration which happens while braking and the engine continuously charges the battery, whenever it is required to do so. The battery-only capacity isn’t much to talk about as Toyota hasn’t deigned it to be an EV anyway. It is a Hybrid Electric Vehicle and it uses both the engine and motor to provide the right amount of power (218 PS), whenever you demand it from the two. There are 3 driving modes from which you can choose one. Eco, Normal and Sport. The names are pretty much self-explanatory. Though we agree that the Camry isn’t a car which you feel like taking to the race track, still in case you want to, we have some good news! Once you switch into the Sports mode, the throttle response becomes non-linear, the steering becomes a little heavier and the car never makes you feel low on power, at all. We pushed the car way beyond the acceptable limits (in a controlled environment) and the engine-motor combination didn’t disappoint us, throughout! The CVT is well tuned and the rubber-band effect isn’t noticeable. Also, there are paddle shifters, in case you feel like using them. However, the car is well calibrated that you don’t really need to paddle-shift often. 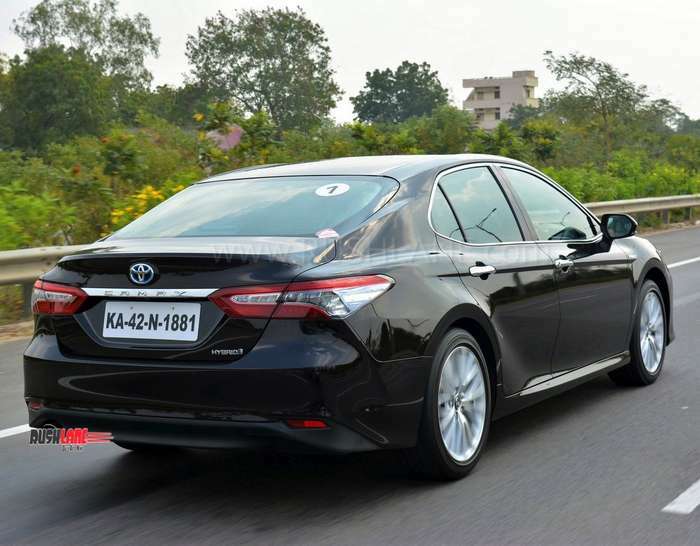 Ride and Handling – Since years, the Camry has been known for its ride quality, surreal NVH levels and the amount of refinement it comes along with. With the incorporation of the TNGA (Toyota New Generation Architecture), Toyota has managed to take the ride quality to next level. German rivals of the Camry might come with more power-packed performance, but they are surely a no match for this Japanese sedan in terms of ride quality. Toyota also mentions that they have incorporated a double-wishbone suspension setup in the rear and we must say that the results are phenomenal. Be it rumble strips, pot-holes, uneven surfaces or any kind of undulation on the roads, the Camry will isolate you from them, brilliantly. Toyota has increased the ground clearance of the car but surprisingly has still managed to lower the overall centre of gravity of the vehicle. This has resulted in some amazing improvement in the handling department, should you decide to throw the Camry into a corner. The car seems well planted even while being pushed hard. However, this isn’t its natural turf. The Camry belongs in a parking lot of a corporate office and more often than not, it will come across the challenges which the urban jungles will have to offer, and you can be rest assured, you will feel very comfortable, be in the driver’s seat or be it in the rear while you work those presentation on your iPad. Safety – For the Camry, Toyota has brought in a comprehensive Safety pack with 9 airbags, ABS with EBD and brake assist, vehicle stability and traction control, front parking sensors and an electronic parking brake. These will help it to easily sail through the upcoming crash-test norms. However, we would like to let you know that in certain countries, the sedan comes with a lot more in terms of Safety equipment. The list includes features like cross-traffic alert, lane-keeping assistant, blind-spot detection system and a pre-collision braking system. Verdict – The 2019 Camry is a luxuriously beautiful package and makes perfect sense in case you are not hell-bent on owning a ‘luxury brand’s keyring. The sedan comes in only 1 trim and is priced at INR 36.95 lakhs (ex-showroom) across India. We will agree that the price might seem to be on the higher side of the spectrum for a ‘mass brand’, but then again, it comes out as a well-rounded deal, with the goodness of being a HV. We hope that the upcoming elections bring in a government which can take a clearer stand on FAME and other policies for Hybrid/Electric vehicles and offer tax incentives to such deserving vehicles. 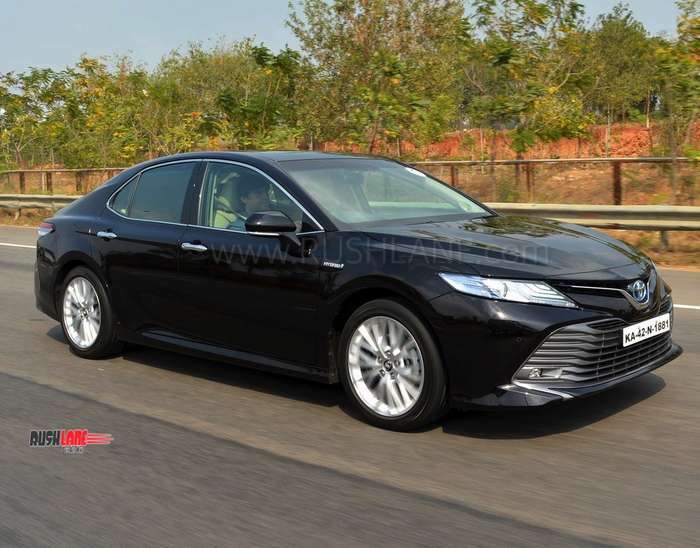 To sum it up, the 2019 Camry is one of the best luxury sedans which your INR 40-45 odd lakhs can buy. Even if you have been eyeing for the Germans since your childhood, do give the Camry a chance and take a test drive. Be it on the driver’s seat or in the second row, there are chances that the Camry will woo you over with its refinement and mannerism! Disclosure: For this review, Toyota invited and hosted us at Hyderabad, and paid for our travel, hotel, and food.